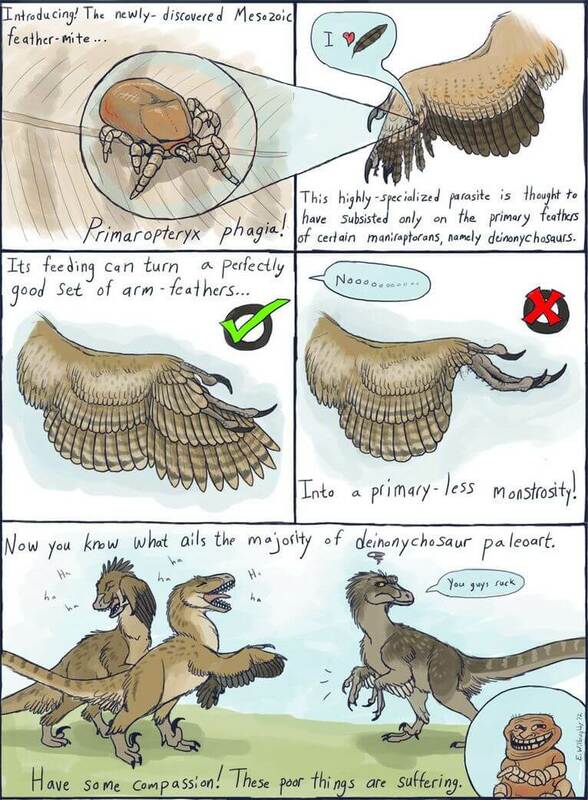 DINOSAURS HAVE FEATHERS! Get over it! While episode 4 of Primeval is about future beetles (so there is little for me to talk about), episode 3 included a Dromeosaur. Or was it? The model from an earlier episode had feathers, but this one they seemed to think: “Screw science, we’ve made so many mess ups we might as well go the whole hog”. 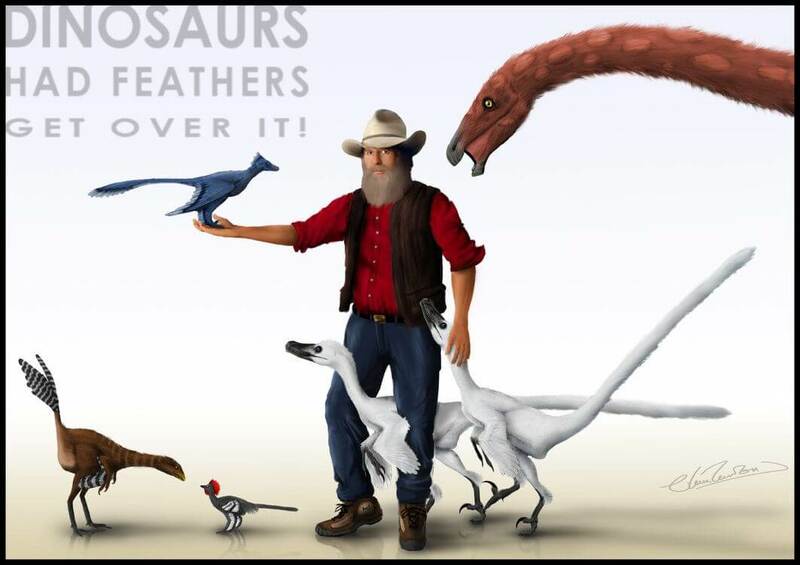 Yes, because some morons are showing OVIRAPTORIDS without feathers too! Oh yeah, we haven’t found a feathered Oviraptor so it OBVIOUSLY didn’t have feathers (note the sarcasm in italics), even though we have found its close cousins with them. The same goes to Therizinosaurs and all other Maniraptorans, plus most baby Tetanurans (enter Sciurumimus) and Tyrannosaurs (Yutyrannus, Guanlong, Dilong). Picture above by Chris Masna of Rob Bakker, one of the first people to theorise that a Dromaeosaurs had feathers. 6 Responses to DINOSAURS HAVE FEATHERS! Get over it! Hey, Edaph, it’s LOTA. I agree 100% with this post. Some of these films are horribly innacurate. Also, that last picture made me laugh. Keep up the good work. I really do hate when people deny scientifically proven things to me it’s like asking someone what color is the sky and them saying green when you can go out and find out the real answer, I’m also gonna throw this out is in the book Jurassic Park (the movie was based off the book incase anyone reads this and doesn’t know) if you bothered to read the acknowledgments he say’s (not exactly) “This book is entirely fiction any factual errors are my own” and who trust a movie or T.V show anyway (unless there there actually about dinosaurs)? “Dinosaurs had feathers” is accurate in the same sense that “insects have wings” is. Many species absolutely had feathers, including dromeosaurs. 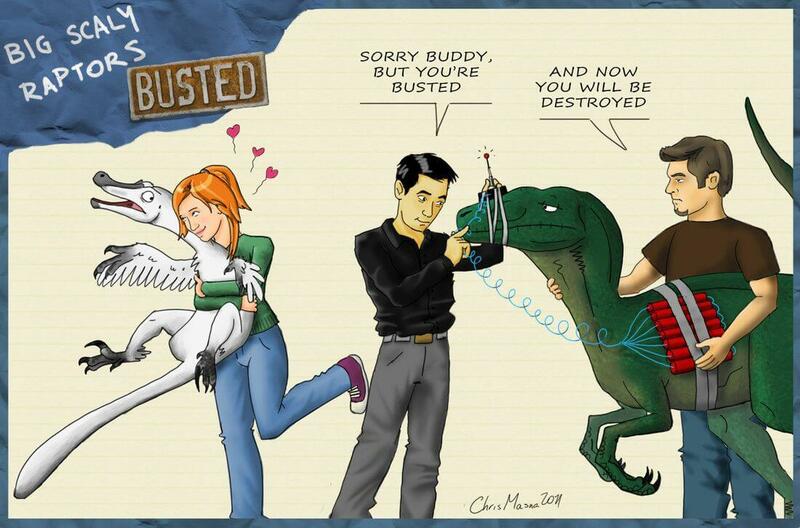 But including a feathered sauropod in that image? *Really*? I agree, Most theropod dinosaurs had and have feathers, I should now, I might be a utharaptor-microraptor mix, Because you neveer now……….. I’m very sereius about this……….